Chloe is currently completing her PhD in philosophy. She enjoys swimming, knitting, and stargazing. A few years ago, I realized that when I was using any kind of fitness equipment with a digital display (you know the kind: treadmills, ellipticals, rowing machines, stationary bikes, etc. ), I became obsessed with the numbers on it. I was always pushing to burn a certain number of calories (are those even accurate, anyway? ), go a certain distance, hit this or that resistance level. I stopped enjoying what I was doing and got lost in whether I was doing it well enough, whether I was worthy, whether others would approve of me. Once I realized I didn’t actually owe achievement to anyone, it was like a light had dawned on me: I didn’t need the validation of the numbers to justify liking what I was doing, or tell me whether I had been successful. I didn’t need the end-of-workout stats to tell me whether I had gone far enough, hard enough, fast enough. I love swimming, for instance. It’s my favourite kind of exercise, no contest. I swam competitively for some years as a teenager, and while I’ve retained good technique, I’m not very fast in comparison to most former competitive swimmers. I’m probably slightly faster than your average lane swimmer, and can pass all the fitness requirements for lifeguarding certification without any trouble, but that’s about it. Once I stopped worrying about my times, though, I was able to reconnect with my love of swimming. Abandoning quantification has done a lot to liberate me from my own obsessions with being good enough (in an exercise context, at least). Pushing yourself can be a good thing, but for me, exercise is a way of escaping from all the other things that I feel I’m not doing well enough. So I started turning off the display, covering it with a magazine or towel, or entering wildly inaccurate numbers about my weight and age. Counting, tracking, and monitoring just took the joy out of it for me, because I was always worried about disappointing myself. So I stopped counting, and started enjoying. But far be it from me to fall into the all-or-nothing camp. Sometimes quantifying things is necessary or useful. If you’re training for a long-distance race, for instance, you need to know how far you’ve gone so you can build up to the final distance in time for the race. And other people certainly seem to benefit from quantifying either to beat a personal best or compete with friends. If you’re one of them, good for you! I do go through tracking phases occasionally, but on the whole, it’s just not for me. I prefer to turn up the music and do some ugly, mindless lip-syncing while I do my thing, although I still keep track of how long I’ve been exercising, and I track my progress when it comes to strength training. And it doesn’t mean that I don’t push myself on the elliptical! But letting go of my obsession with some numbers has helped me let go of my obsession with all of them. It’s reframed my relationship to the numbers, allowed me to retain a healthy relationship to some numbers without assigning huge value to them, or hinging my self-worth on what they say. It doesn’t take stats to tell me whether I’ve had a successful workout. I already know the answer to that without the numbers. The joy is the success. I’ve written before about how I use exercise to manage my mild anxiety and depression. I know I’m not alone in using exercise to manage not only my mental health, but also regular emotions. After all, if I were, rage yoga and countless motivational posters telling you to work out your anger wouldn’t exist. Often, I use more “conventional” types of exercise – running, swimming, weightlifting…even just taking the dog for a walk and breathing some fresh air for a bit. I’ve also written before that I often struggle to motivate myself to actually go do these things. And yes, I do take pride in being able to push myself to go put on my shoes, to hit the pavement, to jump into the deep end. But I’m also an advocate for the idea that you should do the exercise you want to do. If running isn’t your thing, don’t run. Find something else you like, and do that. And whatever that thing is, it doesn’t matter whether it’s conventional or not – just go do it. Haters gonna hate. All this brings me to what has been my saving grace over the last couple of weeks: the humble swing set. Every day, on my walk home from my university, I pass through my city’s botanical gardens, where a simple two-seater swing set stands by the gate. Rather impulsively, after a long and annoying day filled with interpersonal drama, thesis-writing woes, and the (then still-unfolding) election of Donald Trump, I threw my bag on the grass, plunked down in the seat, and started to swing. I hadn’t swung in a long time, and was surprised at how quickly a few pumps of my legs got me as high as the swing would go. Something I never realized as a kid was that swinging is actually pretty physically engaging. Pumping your legs back and forth, hanging onto the chains so you don’t fall out of your seat, that slight lean back as you swing forward, pressing your chest forward as you swing back: my arms, legs, back, and abs could all feel it. Sure, it’s not weightlifting or triathlon training, and it may be a sign that I need to exercise more than I do, but I was surprised at how demanding swinging turned out to be. It often happens to me that I don’t realize how I’m feeling until I’m moving. Exercise helps me think through problems and channel my energy into something productive. I’ve always been drawn to repetitive pursuits: knitting, swimming, running. These activities offer me a chance to tune out for a little bit. I find comfort in the repetition, which quiets the part of my brain that would normally dart around from one thought to the next, and lets me sink into more focused, calmer reflection. It shouldn’t be surprising, then, that swinging back and forth does exactly the same thing. The gentle rise and fall, the rush as you swing through the lowest part of the pendulum. Easy, predictable acceleration and deceleration. I’ve returned to the swing set a few times in the last few weeks because I find it calming and cathartic. When I’m angry, a few minutes of going all-out on the swing set is a surefire way to tone down the anger and start reflecting in a way that really gets to the heart of why I’m angry, think about what I can do about a situation, or work my way through a philosophical problem I’ve encountered while working on my thesis. But there’s another benefit to swinging that keeps me coming back to that swing set, and it’s probably the most important aspect: swinging is really, really fun. Pushing harder, seeing how high you can make the swing go, falling through the air without fear of getting hurt. 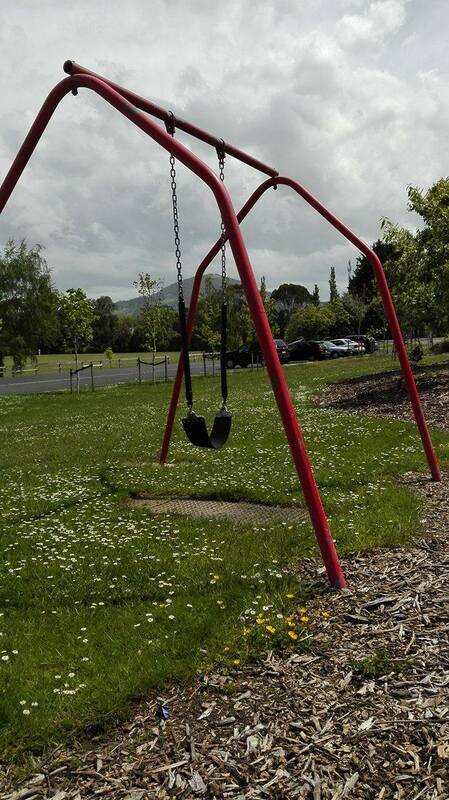 Is it any wonder that children flock to swing sets? They’re exhilarating! The physical activity helps me control my emotions, surely. But doing something just for fun is pretty great, too, and I think that part of swinging is at least as beneficial as the physical activity. One of the swing sets I visit occasionally. Chloe is presently completing her PhD in philosophy. When she’s not busy writing, she can usually be found knitting, gardening, cooking, sewing, stargazing, or lifting heavy objects. I’ve had an on-again, off-again relationship with depression and anxiety for a few years now, which really emerged in a big way while I was pursuing my MA in philosophy. Of course, this isn’t the case for everyone, but I’ve found myself able to manage my depression and anxiety through therapy and exercise. I’ve also had longstanding issues with procrastination, which contributes to the endless cycle of self-talk with “You’re not doing enough,” “You don’t belong here,” “If you were really serious about philosophy, you wouldn’t have to push yourself to work,” and other things like that. While doing my MA, I sought therapy through Student Services and worked with a therapist there, who was herself a PhD student, and our sessions were extremely helpful to me. There are lots of really great lessons I took from the sessions, but two in particular have really stuck out: 1) I need to set significantly lower expectations for myself, and 2) action precedes motivation. As far as low expectations go, the way I think of it is this: if I tell myself that today I’m going to accomplish Things A, B, C, and D, but only end up accomplishing Things A and B, I’ll feel disappointed in myself, and that fires up the cycle of negative self-talk. But if I set out to accomplish Thing A, find that that fires me up a bit, and then also get Things B and C done, then I can feel good about what I’ve accomplished (even if it wasn’t Things A through D). As for action preceding motivation, it’s almost exactly what it sounds like: sometimes, you simply don’t want to do things until you’ve started doing them, but once you get going, it actually feels okay or even fun, and you find yourself motivated to do it. So, what does all of this have to do with fitness? Since starting my PhD study in a new country, the depression and anxiety have re-emerged. Thanks largely to this blog, I’ve managed to abandon the idea that exercise is for aesthetic reasons, and I now think of exercise’s role in my life as being one of maintaining general health, be it physical or mental. It’s not just anxiety that I’ve had this on-again, off-again relationship with, but also running. It’s not my favourite form of exercise (I’m much more in the swimming, weightlifting, and TRX camps), but there’s a lot about running it that draws me to it, like the relative lack of expense, and pretty minimal gear requirements. In my case, there’s also no travel time: I just put on my shoes, step outside, and start running. No need to get myself to a gym or pool first. One thing that often keeps me from running, though, is the idea that I’m just not good at it. I know, I know: how will I ever get good at it if I don’t do it? But what I’ve taken from my therapy sessions is largely applicable to running: like my work in philosophy, I need to remember to set lower expectations for myself, and remember that action precedes motivation. Now, I’m not a fast runner, and although I’m fairly tall, I don’t have that long graceful gazelle-like stride that seems to come so naturally to so many other tall runners. I get red in the face quite quickly and find myself huffing and puffing much sooner than I’d like to admit. But setting lower expectations for myself means deciding that some days, five minutes of red-faced, huffy puffy running is good enough. (Yeah, I know it’s significantly less than experts recommend. But if I try to convince myself to run for twenty minutes, I often don’t wind up going at all. Low expectations, remember?) And the other thing is, sometimes that five minutes turns into ten. And then the ten turns into twenty. And sometimes twenty even becomes thirty. Action precedes motivation. Admittedly, when it comes to running, I don’t have much of a routine. Often, it’s just a matter of thinking, “A run might be nice,” for whatever reason (I’m cold and want to warm up, I feel like I haven’t accomplished anything that day, I want to feel strong, or I want to work through a philosophical problem that’s bothering me, for instance), and heading out the door five minutes later. I tend not to time myself or map out any particular route, because I know from my own experience that quantifying things is the fast track to taking the fun out of it. I’ll have to develop some kind of a routine over the next few months, since I spontaneously signed up for a half marathon just earlier today, but that’s quite a ways off and I still have time to enjoy the lack of structure. Again, low expectations are where I need to start. Running is helpful in managing my depression and anxiety in two ways. There’s the obvious one: that exercise is simply good for your mental health. The second one, though, in my case, is that working at implementing those two lessons when I run is that I get that much better at implementing them in other areas of my life, notably my grad school work. Convincing myself to write just one paragraph or read just one article sometimes takes more effort than I wish it did, but the point is to start. Plus, it’s a little easier to enjoy running when you get scenery like this to look forward to.